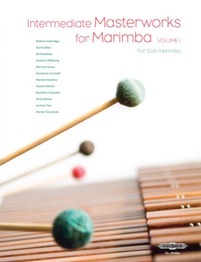 24 marimba solos fostered through ZMF New Music, our historic joint-commissioning project, 2006-09. Published in 2 volumes (Edition Peters): 12 pieces in each book. All 24 pieces are recorded on a double-CD (Bridge Records). Visit the website that provides the history of the project. - Join us for phenomenal solo and chamber music performances centered on the marimba, vibraphone and percussion. Musical styles will span classical, recent compositions, jazz, folk and pop. - Cash & credit cards accepted at each event. Sales begin 45' prior to event. Opening night of the ZMF 2017 Concert Series will feature two well-known mallet artists based in New York City playing with small groups. Israeli marimbist Yaniv Yacoby and pianist Chase Morrin will perform selections from their jointly-composed project, The Corn Knight: a collection of short pieces informed by a fictional narrative. Stylistically, it draws from Irish and American folk, jazz, and Western classical traditions. The structure is mostly through-composed, but the details---such as ornaments, grooving patterns, and sometimes entire melodies---are improvised. Ria Ideta is a masterful musical artist who has rarely been heard in the U.S. Based in Berlin, she performs more than 50 concerts annually throughout Europe, earning much attention in every location. Her ZMF recital will feature adaptations of music by Stravinsky, Ravel, de Falla and Stanley Myers, as well as excerpts from Concerto for Marimba by Israeli composer Ohad Ben-Ari which she premiered with the Japan Philharmonic Orchestra in 2014. This will be a four-part program beginning at 6:45 & ending by 11pm. We hope you will join us for a very special journey (with many breaks)! Dr. Paulnack's thoughts on music have appeared in six languages, on over 100,000 websites, and in program books of orchestras and concert series around the world. In 2009, Linda Ronstadt quoted him during her testimony to the U.S. Congress on behalf of funding for the arts. Rutgers' own faculty member Mike Truesdell will perform his program Reflections--pieces that explore the process and product of inspiration--including music of Molly Joyce, Theodore Wiprud, Stuart Saunders Smith, Kevin Puts, and more. Acclaimed Japanese marimba artist Nanae Mimura's solo program will feature compositions recorded on her latest CD on Octavio Records: Marimba Crystal--Prayer including works by J.S. Bach, Anna Ignatowicz, Keith Jarrett, & Takashi Yoshimatsu. This Dutch minimalist work (for open instrumentation) is a huge favorite of classical/contemporary audiences in the Netherlands. We are excited to introduce it in the U.S.! Both parts of tonight's program feature works from (or influenced by) the classical, contemporary, and Latin idioms. The first will include works by Wolfgang Amadeus Mozart, Robert Aldridge, Christos Rafalides, Tite Curet Alonso and more. His program will feature works of J.S. Bach (Chaconne), Steve Reich (Electric Counterpoint), and Alejandro Vinao (Khan Variations). 6:45 pm - Pre-concert talk with tonight's artists - hosted by Mike Truesdell. This will be a 3-part program (with breaks) ending around 10pm. Fantasia for Marimba - Zeltsman`s solo set will feature works by Peter Maxwell Davies, NJ-based composers Harold Oliver, Steven Mackey and Robert Aldridge, and others. 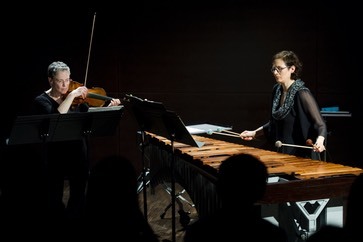 A duo set features premiere adaptations for marimba duo (pieces originally for piano): Sonata No. 1 by Roger Sessions, Music for Piano by Irving Fine, and the beloved Shaker song Simple Gifts. Music of Argentina - Van Geem`s solo set will bring the evening to a rousing close with music of Astor Piazzolla, Maximo Pujol and more! "Theater percussion" has seen a rise in recent years as a fascinating vehicle that can get at the heart of musical expression. A quiet person by nature, Haygood nevertheless possesses a compelling presence and special gift in this arena. His program will include works by Stuart Saunders Smith, Mark Applebaum, Casey Cangelosi, and James Rolfe. Haygood is a graduate of San Jose State University (BM) and The Boston Conservatory (MM'16). Luxembourgish percussionist Sven Hoscheit won the Press Prize and 3rd Prize at the 2016 Tromp International Percussion Competition. His special program for ZMF will feature some of the works performed during the competition by Jacob Druckman, Iannis Xenakis, and Astor Piazzolla, as well as works by Arnold Marinissen, Franz Liszt and Daniel Levitan. Hoscheit is currently a masters student at Conservatorium van Amsterdam, and a freelance percussionist in Holland and Luxembourg. The evening will open with ZMF 2017 participants performing ensemble works coached by faculty including Woodcuts (After Satie) composed by Zeltsman, and other works TBA. The second half of the evening will feature I.N.K. Experiment: a percussion duo project born from the idea of multicultural interaction and artistic freedom. Inspired by their roots (Serbian-Croatian-French), Ivana Kuljeric Bilic and Nikola Krbanyevitch aim to express themselves through improvisation and reinterpretation of pieces ranging from folk and classical to contemporary experimental music. ZMF 2017 will wrap up with a celebration of the fabulous musicians who have studied in the program over the past two weeks. More than 40 young solo and chamber musicians from across the U.S. and around the world will perform. All programs may be subject to change.